Part 2, What Is a Medical Marijuana Card? What Is a Medical Marijuana Card and How Do You Get One? 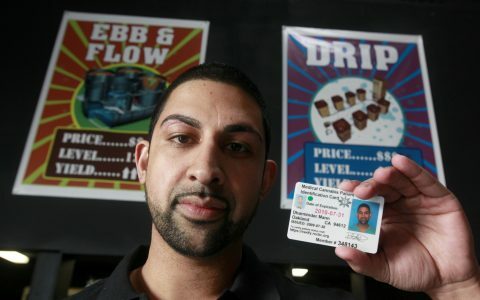 A medical marijuana card (also known as “MMID” or “cannabis card”) is an identification card used by patients to enter medical dispensaries (or “cannabis clubs”) and purchase the plant to treat their corresponding health ailment or symptoms. It also allows for the patient to grow at home and use medical cannabis delivery services. The cards are issued by the state, but the patient must first get a signed recommendation from a licensed physician to qualify. The patient and doctor need to agree that cannabis would be an effective treatment option, and the patient’s condition must be an approved condition by the state. With the doctor’s recommendation, the patient then needs to apply through the state and pay a fee, which will also vary depending on the state. Doctors can’t simply prescribe cannabis to patients due to the plant’s federally illegal status. The technicalities of how to get an MMID and what it provides you will vary depending on the specific state’s laws and policies. As cannabis legalization expands, the process for patients continues to evolve, especially with more states legalizing recreational (adult-use) cannabis. ID card not necessarily required! Often, all you need is the letter your mmj doctor gave you and your driver’s license (to prove you’re the one on the letter). Check you local mmj laws before paying for s/t you don’t need. Still sounds too complicated? Then simply go to a local dispensary and ask them what they require! If you ask me, I’d say that the card is kind of difficult to obtain. I got a doctor’s recommendation for having PTSD, no problem with that part. I had to do a lot of calling around to find a physician that is licensed to prescribe. After having found one several miles away from my town, I got in for an appointment.. but not until an entire month from now. I had to print out about 15+ pages, some of them being the forms to fill out to bring with me to the appointment and the welcome letter. It’s a huge disappointment to have to suffer so much while waiting. THC products have been the only successful remedy for my illness in the past. I tried a CBD tincture and it didn’t help at all with my symptoms. It’s also maddening when I see people reviewing dispensaries in my area and not being able to go to them. The medical card “program” is very unfair and I thought that I needed to express it. I would like to share my experience as i am an anxiety patient. This was getting very difficult for me to work upon my things but then my colleague suggested me to try marijuana and it gave me good results. I was happy and thought of having marijuana so I started searching for it.Found online medical card which help me out to consume it legally.